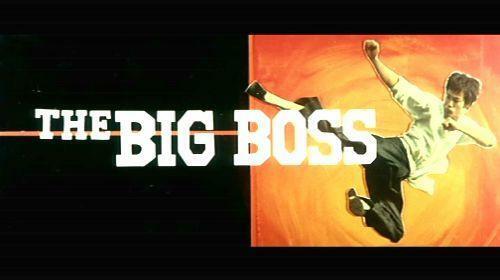 The Big Boss is the film that launched Bruce Lee’s career into overdrive, catapulting him to the rank of International Martial Arts Superstar after a number of smaller parts in previous films. It really is strange that it was this film that launched him as he spends a good portion of the film in the background. In fact it’s not until a good forty minutes into the picture that Bruce eventually does the man dance with a couple of thugs. Bruce plays Cheng Chao-An, a quiet, humble man who has moved to Thailand to live with his cousins and find work. Cheng has made a vow to his mother never to fight again, wearing a Jade talisman around his neck to remind of him of this pledge, for reasons uncertain to the viewer. This only adds to the mystery of Bruce's character and his Zen-like nature. After finding work at a local ice factory with his cousins, Cheng and the others notice that employees are disappearing after one of the workers stumbles across a bag of heroin that was stashed inside an ice block. Apparently this isn't the first time something like this has happened at the factory. Cheng and the rest of the workers suspect it has something to with the factory boss, son of the big boss who owns the factory. When one of Cheng’s cousins goes to confront the big boss about the disappearances and doesn't return, Cheng confronts the factory boss. In an effort to silence Cheng, the boss makes him the new foreman, after a scuffle with some of his henchman and encourages him to forgot about what’s happened. This doesn't sit well with Cheng's family who shun him because of his new found station in life and the circumstances to which it has come around. It doesn't take Cheng long to realise that he's been made a fool of and begins a campaign of revenge which will lead him to the ultimate showdown with The Big Boss himself. If people knew what was going to happen to Bruce Lee with his instant fame and untimely death, perhaps there might have been a better effort to preserve the films of this martial arts icon. The video is presented in its original theatrical aspect ratio of 2.35:1 with 16:9 enhancement. And unfortunately the years haven’t been good to the print. While the image has been cleaned up as best as possible for this transfer the image suffers from a lot of film artefacts. Dirt and damage to the print itself the main culprit that plagues the transfer at times. The colour is also washed out and the overall shadow detail is poor. Sharpness is an issue and is inconsistent throughout the transfer, with a number of scenes suffering from focus uniformity. There was also some pretty severe aliasing and the telecine threw a wobbly in a big way a number of times that were more noticeable in the latter half of the feature. The audio that accompanies the feature comes in two flavours; and depending on your mood both are reasonable. 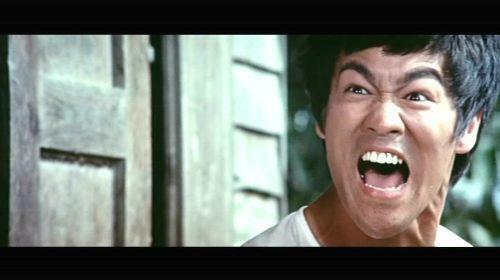 As was the case with the majority of martial arts films of the time they were filmed silent. With languages later dubbed to suit the targeted market. For this release we have an English dub in Dolby Digital 2.0 Mono, and a Cantonese dub in Dolby Digital 2.0 Mono also. After listening to both for this review I found the Cantonese dub was the better experience, the English dub was too funny, suffering from some really poor voice talent. There are English subtitles which accompany the feature should you choose to listen to the Cantonese track. And for the most part read a lot better than the English dialogue. The audio for the Cantonese track was a little fuller and sounded less compressed than the English track, which distorted a number of times. The sound effects that are often parodied are presented in all their wet-slap sounding glory and are common across both tracks and hold up well. The musical cues in the Cantonese track are vastly different to the English as well. With Pink Floyd's Time recurring throughout the film which suited perfectly increasing the tension and the mood. While the music in the English dub was very harsh which had a tendency to distort at high volumes and was instantly forgettable. 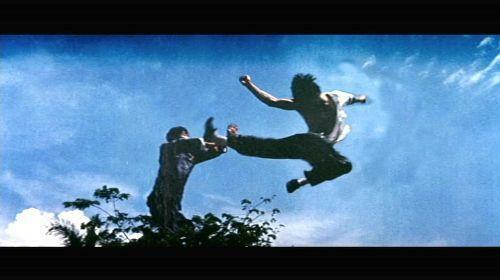 Hong Kong Legends know how to look after fans of martial arts films that's for sure. And the small extras package for The Big Boss is excellent. The highlight is the audio commentary by Bey Logan a Hong Kong Cinema Expert. Bey provides one of the most detailed commentaries I've had the pleasure of listening to. While not entirely screen specific, the information behind the film is incredible and leaves no stone unturned. If you are ever in a bar and come across Bey, don't even bother getting into an argument about Hong Kong films because you will be sure to lose! This guy knows his stuff. There is a Photo Gallery that consists of 20 stills of the production behind the scenes. An Animated Biography Showcase is a strange fruit consisting of a group of photos down the left hand side of the screen that change while a crawl of verbiage runs down the centre which is narrated charting Bruce Lee's beginnings and unfortunate end to the legend that followed. There are two Trailers one is the UK DVD promo trailer and the other the lengthy Theatrical Trailer which contains two deleted sequences that didn't make it. These are accompanied by some explanatory text as to their placement in the film should they have been included. 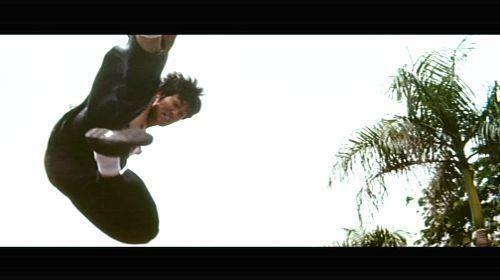 There is also a Promo Trailer for the Hong Kong Legends collection and trailers for the following releases Fist of Fury, Project A, Way of the Dragon, Mr. Vampire and Young Master. The Big Boss finally gets the respect it deserves with this release on DVD. After the appalling Avenue One release of a few years ago this is a vast improvement. Visually and audio wise it's about as good as it will get until someone commissions a full restoration with plenty of dollars to throw at it. The Big Boss is a required purchase if you're a fan of Lee's work, and is the best place to start if you're new to the legend. 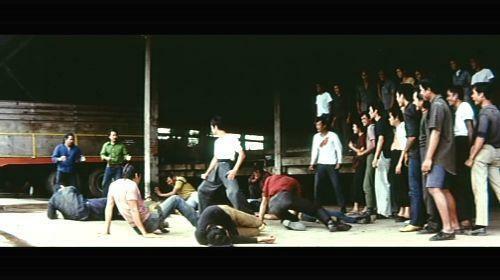 A reasonable amount of extras have been provided considering the circumstances, with Bey Logan's commentary essential listening for fans of martial arts. Cast your vote here: You must enable cookies to vote. "...a required purchase if you're a fan of Lee's work. And the best place to start if you're new to the legend." "Armour of God is definitely not one of Chan’s better films. While the action is good, the weak plot and hammy acting make this a hard task to sit through. " "Ms Jones may not be everyone's cup of tea, but fans of her work will have little hesitation in adding this disc to their collection." "If this is an indication of what Perce Brosnan is going to do with his career post-James Bond, I’d be calling MGM and begging for my old job back!" "Police Story is a decent action flick that features incredible martial arts action as well as Chan's signature death defying stunts." "Taken is an enjoyable series, with the DVD medium being the best way to enjoy it. " This browser doesn't support iframes. This browser doesn't support iframes.